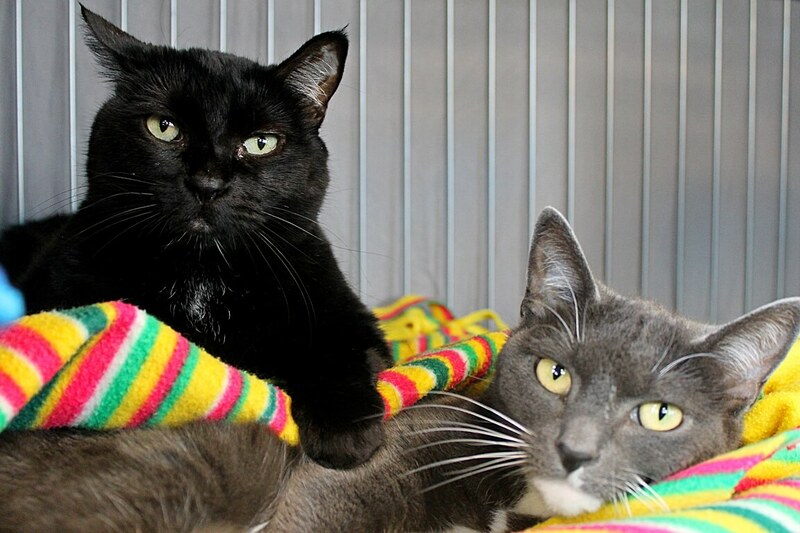 Delta (left, black) and Charlotte (right, grey) are two absolutely lovely adult lady cats who just adore attention! Delta is an 8 year old girl and Charlotte is around 4 & 1/2 years old. They were adopted as kittens and lived with a family their whole lives until recently, they were returned to Pixie due to the previous family’s circumstances. It is obvious they were shown a lot of love, because they are some of the sweetest cats you will ever meet! Delta is an adorable, chunky lady cat who is very chatty and will give little chirps for pets — she just can’t get enough attention! Her sister Delta is slightly on the shyer side, but is very sweet and snuggly as well and will purr almost instantly for anyone who offers her some affection. These two ladies love to curl up together and sleep side by side, so we would love to see them go into a home together. Their history with their former family suggests that young kids may be too over-whelming for them, but they would be perfect for a couple, single person, or family with older children. They are incredibly loving, in excellent health, and they cannot wait to find their forever family! Are you interested in taking them home? Stop by Petco Unleashed on NW 23rd & Burnside today! They come to you fixed, vaccinated, and micro-chipped for a combined adoption fee of $180.